With a productive wine area of over 30, 000 hectares New Zealand has become an important wine producing country over the last 30 years. The growth in the wine indusrty didn't happened by chance. Right from the early beginning in the 1970's Kiwi's have adapted what they already knew to this new fledging industry. One great example was the universal use of stainless steel in winemaking adapted from the norms and standards of the New Zealand dairy industry. This Kiwi DIY attitutde meant that winemakers adapted and made use of the existing small-scale industrial infrastructure economically from the start. Holdm® is another example of the "can do " attitude that Kiwi's are reknown for world wide. 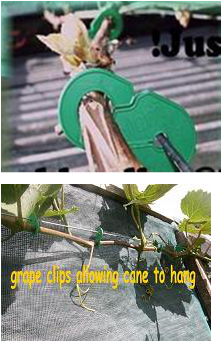 Hold drip irrigation tubing or wires together. foliage growth, holds strong, and is reliable and easy to use. 1-3 years of age. 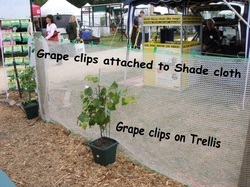 Allows vines to mature without girdling. Holdm clips are marketed in packs of 10, 20’s and 50’s, mixed packs in the same numbers are also available.